PartyPoker.com is by far one of the most reputable, well known poker sites in the world. After joining this site and becoming a member, you will be able to take part in the sites huge selection of tournaments and cash tables, playing people from literally all over the world. The ultra secure Thawte encryption technology ensures that all data and accounts are protected, using a 128-bit encryption. The site has been a trusted poker site now since 2001. If you think you are good enough, you can even get a chance to play the famous Tony G, a pro player sponsored by this site and a familiar television poker face. Playing poker through this site means that you will have access to some of the fastest and sharpest looking tables. Customize your own settings to make the site more unique to your own preferences. Change the size of the tables and add or remove the avatar feature. Colours can be changed and there is also a ‘hot hand’ feature, which basically alerts you when you receive an awesome hand like pocket kings or pocket aces. Play at the poker tables from almost any computer, in the instant mode, or the recommended download mode. This is quite a useful area of the site, however, they are probably not used to receiving many problems/complaints, as the site has been so well structured and developed. On the other hand, if you do have a question, simply view the contact us section and send an email to the supplied address, outlining your query. What’s more is that this site has Live Chat. This is fantastic and means that you can instantly contact a member of staff (not a robot) and you issue/query can be dealt with immediately, no waiting. The download mode can be translated into over ten of the world’s major languages, so less people now miss out on what this giant of a site has to offer. Stay up to date with the latest news and events from the poker world. 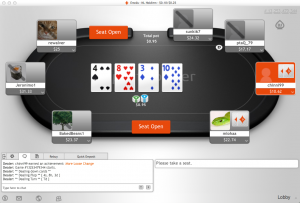 If you are a poker fan, this site offers a bit of everything relating to the game. There is a welcome bonus, worth up to the value of £10 t o play cash games, to be received once you have registered. The thing that you must remember with this site is that the general payouts and top prizes are a great deal larger than on most sites, and at the same time, these huge payout games are a lot more frequent, being played continuously throughout the day. Follow this link for the Party Poker bonus code and redeem extra offers. Click here to get the New Jersey Partypoker Bonus Code. There are some attractive packages that can be won from this site with an awesome loyalty point’s scheme. These points are the PartyPoker points. Approximately 1 million prize cards are up for grabs, each one being a winner. All you have to do is claim your prize. Freeroll entries, up to $4000 in cash, or even a seat at the most prestigious WSOP poker tournament can be one through The Gladiator. This all-action poker cash game (which is a televised event) has a package up for grabs worth $15,000. A huge giveaway in cash prizes worth a cool $1,000,000 can be taken from the Spring Million. There are plenty of generous Freerolls for all registered user running throughout the week, each and every month. 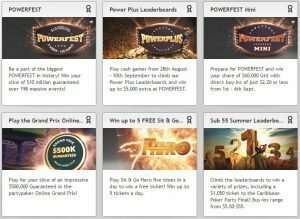 Other promos include the powerfest – always nice to get rewarded for losing! See full details for other tournaments that run throughout the week with some massive top prizes, and low buy-ins. If you are thinking about signing up, this is definitely one site that you shouldn’t hesitate on when it comes to registering an account. The payment and withdrawal methods are safe, with the most popular methods being used. The prizes are huge, and the entertainment value is an added bonus.